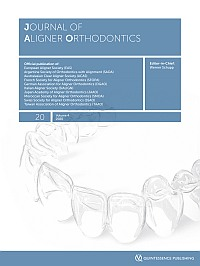 The Journal of Aligner Orthodontics publishes clinically relevant articles in the field of Aligner Orthodontics. The journal is peer reviewed and claims to be the reference journal for Aligner Orthodontics, showing the whole potential of the field. The journal aims to provide in-depth knowledge to orthodontists and people interested in orthodontics, from beginners to the most advanced practitioners. Articles deal with basic procedures, case reports about special situations, multidisciplinary treatment including aligner procedures, and original studies (clinical studies, studies on materials and devices, literature reviews). Auxiliary procedures such as scanning and 3D printing are also covered. 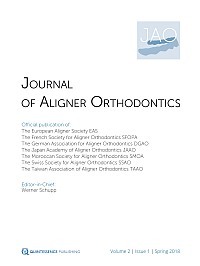 In addition, the journal contains editorials, expert discussions, tips and tricks, learning from mistakes, summaries of publications from other journals, book reviews, and news from the industry. Online access to full text articles (pdf) is granted only to subscribers of the journal or of corresponding online services. For more information about the registration procedure for online access please see our » online access information. is published by Quintessenz Verlags-GmbH, Berlin. Court domicile and place of performance: Berlin, Germany.